Here's a selection of products we've discovered -- many organic -- to help you look beautiful and feel great, while still being healthy for you and the environment! 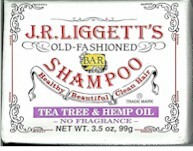 JR Liggett's Old Fashioned Tea Tree and Hemp Oil Shampoo Bar. No Fragrance Added.. Contains: olive oil, coconut oil, castor oil, pure spring water, sodium hydroxide (a binder), tea tree oil, hemp oil and almond oil. No animal products or Sodium Laurel Sulfate. No plastic bottle to hurt the environment. Natracare's tampons are not bleached with chlorine, which contributes to dioxin pollution. And certified organic means that the cotton was grown without pesticides or chemical fertilizers. Made in Germany. 20 digital tampons. Natural oils - contains NO animal products, or preservatives. It doesn't strip hair of its natural oils. It makes a luxuriously thick lather. It rinses out clean and easily. It's especially good for permed or colored hair. It gives your hair body, and manageability. It leaves your hair soft, healthy and smelling clean. It's great for TRAVELING OR BACKPACKING. 100% Biodegradable with minimal packaging. No Sodium Laurel Sulfate or DEA. The nasal passages are lined with a thin layer of mucus that is one of our body's first lines of defense against disease. A nasal wash keeps this layer of mucus moist, clean, and healthy, and compared to other nasal wash techniques is much easier, simpler and quicker to do. Rinsing with saline solution is a time-honored practice in the Orient. Here in the West, the nasal wash has been used for decades as means of treating sinus problems, colds, allergies and chronic post-nasal drip and to counteract the effect of environmental pollution. One soap for 18 different uses. 100% Vegan. Made with organic oils. 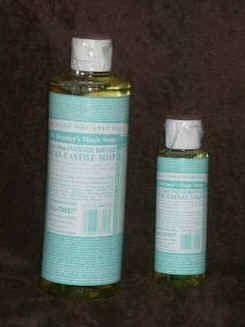 Super-mild Castile soap has outstanding water softening and cleansing powers. Great for travel -- use it for shampoo, soap, body wash, tooth-brushing, deodorant, hand-washing clothes. Ingredients: water, saponified organic coconut and organic olive oils (with retained glycerin), organic hemp oil, organic jojoba oil, citric acid, vitamin E.